Chief Warrant Officer 2 Adrian Romero, right, native of Douglas, Ariz., field artillery targeting technician, assigned to Headquarters and Headquarters Battery, 3rd Battalion, 13th Field Artillery Regiment, 75th Field Artillery Brigade (FAB), and Sgt. 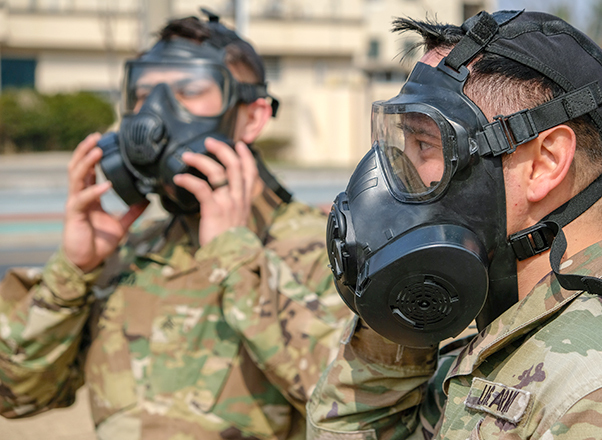 Juan Garcia, native of Lancaster, Calif., track vehicle repairer, assigned to Battery B., 6th Battalion, 37th Field Artillery Regiment, 210th FAB, don their M51 masks during Sergeants Time Training, March 28, 2019, Camp Casey, Republic of Korea. Romero and Garcia spent the day’s STT training fundamental Soldier tasks in preparation for 2ID’s upcoming Best Warrior Competition, April 15-19.